Well, it sure has been some time since I was last able to take a look at some high performance RAM here at MBR, but today we end that cycle with a breath of fresh air. Vista is here and so is the need to upgrade RAM for all those early adopters out there, myself included. Today’s testing will be conducted on a WindowsXP platform, however look out for several Vista results in the coming weeks. ..:: Super Talent T1066UX1G5 Specifications ::..
As you can see from the specs listed above, these modules are competitive with the big boys in terms of rated frequency and timings required to achieve said frequency. Super Talent does not provide any rated voltage for reaching this frequency, so for testing purposes we ran them at 2.2V, which is a common option on performance oriented motherboards. In terms of product packaging, minimalist is the way I’d describe it. 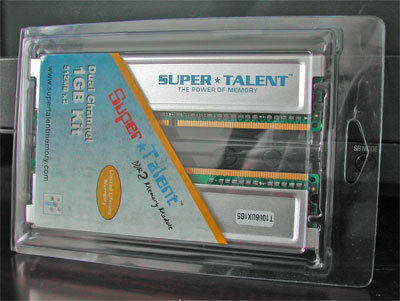 Super Talent packages the two modules in a plastic casing, along with the little graphical identification card. Other than these items, the package is bare. If you don’t know how to install RAM, clearly not the best option, but then again if you don’t know how to install RAM you probably shouldn’t be delving into overclocking just quite yet. The modules themselves are both single-sided. 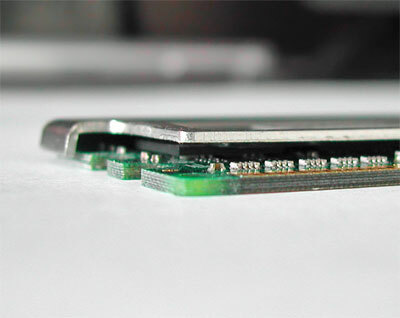 The heatspreader is affixed only on the side with the RAM chips, unlike some other single-sided modules that have a full wraparound heatspreader installed. In this case it probably won’t make too big of a difference even with some additional heatspreader material. 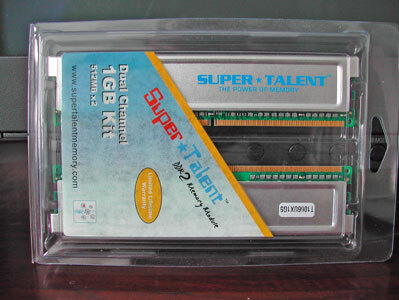 The heatspreader itself is even quite plain, silver with the Super Talent logo emblazon in light blue and a sticker identifying the module type.